GREENGUARD, a program by UL Environment that aids environmental concerns by identifying products and materials that have low chemical emissions, revealed a surprising fact about indoor air quality. According to them, indoor air is two to five times − and in some cases even 100 times − more polluted than outdoor air. This means that by breathing the air indoors, we become more exposed to various environmental pollutants. In this article, Renewal by Andersen® of St. Louis discusses how indoor air quality can affect the health of your family as well as ways to improve the quality of air inside your home. Molds, particulates from products, dust tracked in through your doors, and poor ventilation all contribute to poor indoor air quality (IAQ). However, of all the culprits behind poor IAQ, the most harmful are arguably chemical emissions. Exposure to airborne chemicals from products such as building materials and home or office supplies can contribute to various health effects. How does IAQ it Affect Your Family? Exposure to pollutants makes one susceptible to respiratory diseases and allergies. However, as children take in a greater volume of air compared to adults, they become more susceptible to these pollutants. Moreover, since children are much closer to the ground, they end up inhaling more of the heavier airborne chemicals than adults do. The nose filters particulates and fibers. Since infants and young children breathe through their mouths, however, there is no chance for pollutants to be filtered, which increases youngsters’ pulmonary exposure to them. Their high heart rate also allows substances that are absorbed into the blood to permeate faster throughout their tissues. Even UL Environment agrees that the best way to nurture the air your family breathes is to keep pollutants out. Contact a reliable Chesterfield, Missouri windows company such as Renewal by Andersen of St. Louis for products that help improve the quality of air inside your home. As people spend 90% of their time within the confines of their homes, schools, and workplaces, indoor quality is a significant concern. 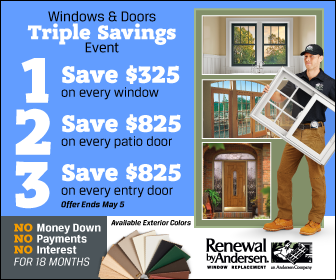 This is why Renewal by Andersen of St. Louis offers a wide range of quality Chesterfield doors and windows that will keep your homes sealed while providing outst anding ventilation – and consequently, outst anding indoor air quality. Our products are also energy-efficient, helping you lower your energy consumption and cut down your energy expenses while protecting the health of your family. Give us a call today at (314) 332-2364 or fill out the form on our website so we can start improving the quality of air in your home.